I think my most successful print was the ​Screen Print. Once we got the hang of it the second time we made this really cool triangle that looks as if it was dripping down. It ended up looking really interesting even though our intention wasn't for their to be a dripping effect it was a happy accident. If I could have a do-over and re do one print I would re-do the Styrofoam (radial design). The first two times I did it in my series (1/4 and 2/4), I did it the wrong way. I then fixed the way I was doing it so the last two Styrofoam (radial design) in my series were done properly but I wish the whole thing was done properly. I enjoyed doing the Collagraph the most. I liked working with the hot glue and making my own original shapes and using the brayers. I also liked working with the different colors and then those colors being combined with the brayer. I was probably my favorite to work with also because of the printing press because i had bubble wrap on my Collagraph and i could hear it popping. When I started this project I had no idea what I wanted to do, but I have learned that all the best artwork comes out of boredom and not knowing. So I walked outside in my hometown of Goldsboro, and I live in somewhat the country so there are tons of fields not many trees and leaves. I did however find this pine straw thing and it had fuzzy seeds growing out of it so I went and grabbed a bunch of the straw like material and extracted the fuzz from it. I put it into a red solo cup. Then I grabbed a spoon scooped different dirt from my yard and mixed them together to create a thick paint like consistency and then I walked in my driveway and splattered the mud paint in strategic patterns and then sprinkled the fuzz on top of it and got on abstract splatter painting. The art represented my emotions of confusion and sadness and frustration on that Sunday afternoon due to my 14 year old dog passing. So expressing my emotions and creating the art helped relive my emotion and sorrow. I can develop skills on carving and color matching. I learned that the slower I am the nicer the cuts were and the cleaner they ended up turning out. I also tested my colors on scrap paper to match them up with the color scheme I wanted. Also the color of the cut out triangle on top are intended to look jagged. Some of the problems I faced were my cuts in the foam exceeding past where I wanted them to, but I learned to adjust my triangle and make it bigger or smaller or change the shape. I explored using the glue and what was the best way to use it on the cup. I ended up putting the glue on the cut out Styrofoam then let it dry, then went in and colored the jagged edges. Our Abstract group piece was based off of prior artwork. We used a viewfinder to magnify certain parts of our compositions. We tooks aspects from each of our prior artworks and we made our newest piece "Magnafie". We then sketched out what we wanted our piece to look like with all the different aspects on transfer paper. Then we choose our color scheme and we painted our background color onto our canvas, which didn't go exactly as we planned but we still were able to bend to how we wanted it to go and we had to change up the color scheme a bit. Then we transferred our artwork onto the canvas.We used many layers of paint to get our desired color. We also used stamp rollers to get our desired textures. Then at the end and we got it how we liked we all worked together to painted the sides then dried it and took our final photo. 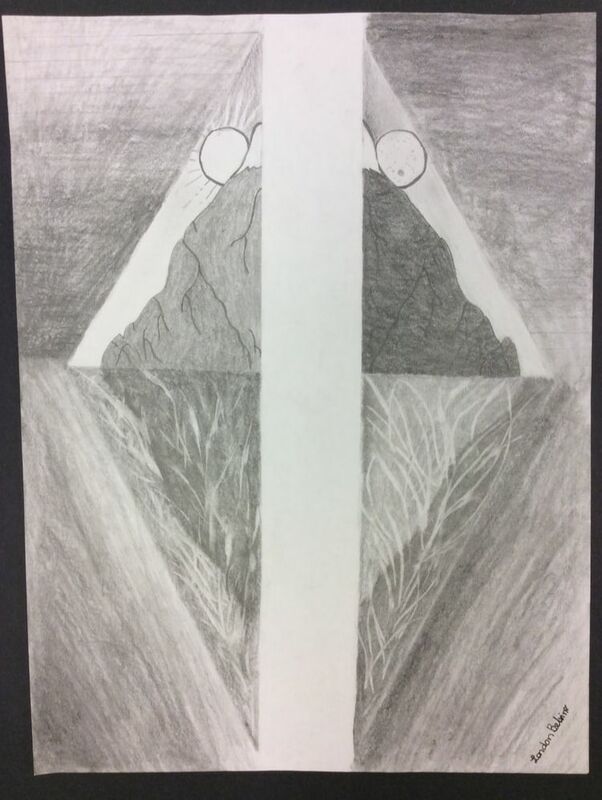 The title of my artwork is " opposites" because it represents two mountain sides one day and one night, one sun and one moon. So therefore it is opposite. My artwork is a geometric triangle separated by a white rectangle horizontally through the middle. My medium was a Graphite pencil. I learned new techniques for shading and how to hold a graphite pencil to create certain textured looks. I started researching different types of landscape pieces to see what I liked and what I wanted to do so I created my own version pulling ideas from different places. I experimented with different types of pencils and with shading until I found what looked best. I changed some parts of my piece while creating it multiple times before I reached my final piece. The title of my artwork is “Ink splash” .My artwork is a fantasy figure on the beach. My artwork media is Watercolor paper, Ink splats, Black sharpie, Watercolor pencils, and water. I didn’t have a certain technique when it came to creating my artwork, I just played around and saw what worked and what didn’t. 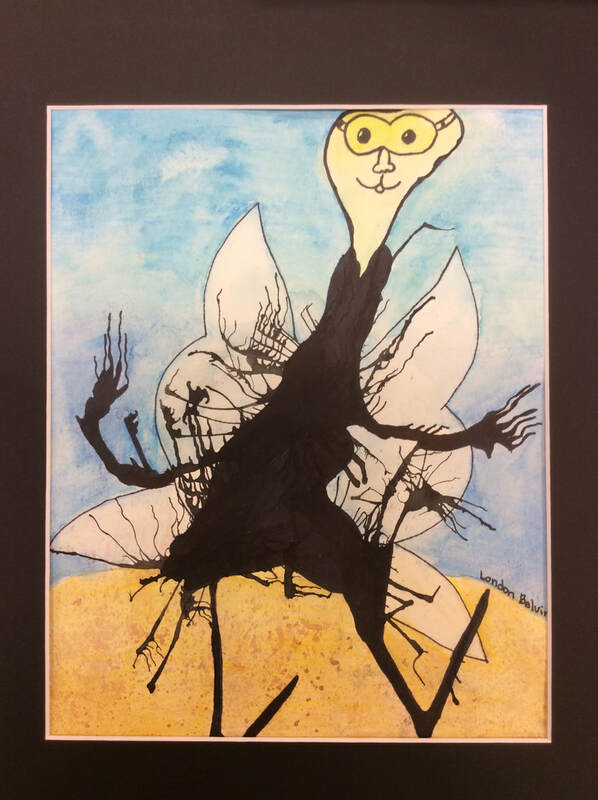 The “Big Idea” behind this artwork was to create a animal or creature of sorts with the ink splats. So I splattered ink on a paper and blew it around then let it dry and made and animal out of it. My goals as an artist is to get better and learn more about different medias and I seem to be reaching that goal. I'm a Vernon Malone high school student. I'm a learning artist. I believe in peace, love, and equality.